Did you know many companies offer a matching gift or volunteer grant programs to encourage philanthropy among their employees? And that some companies will even match to spouses and retirees? By simply completing a matching gift form (on-line or paper), you may be able to double, or even triple, the impact of your gift! Contributions of any amount help us save and protect wild cats in captivity and in the wild! We are pleased to partner with a company called Double the Donation to compile information on matching gifts. If you see anything that should be changed, please email Double the Donation. Requesting a matching gift is normally a 3-5 minute process which must be initiated by the donor. You can do this by filling out and submitting a paper match form provided by your employer or through an electronic submission process. For questions regarding your company’s programs, please contact your employer’s HR or community giving department. For questions regarding submitting a matching gift or volunteer grant request to Carolina Tiger Rescue, please contact us. Carolina Tiger Rescue is a public charity classified as exempt under section 501(c)(3) of the Internal Revenue Code. Our tax ID number is 56-1522499. 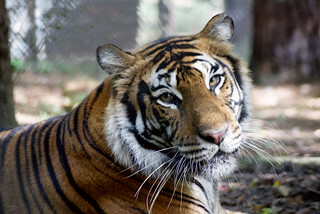 As of July 1, 2018, our name was legally changed to Carolina Tiger Rescue, but you may need to search for Carnivore Preservation Inc. as we transition to our updated name.